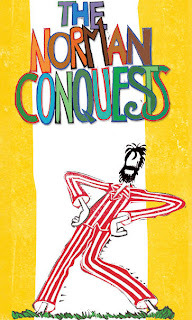 The Norman Conquests, playing at Circle in the Square, is a three play trilogy that's not really a trilogy. That's to say, it doesn't matter which order you see the three plays yet they are related. It involves the same characters over the same weekend and that's about all I can tell you. I caught Round and Round the Garden last night. It was weird and funny and today I'm thinking it was downright wonderful. The cast is incredible. It's a a revival and this fabulous production is a British import from the Old Vic. I'm a fan of Britcoms and it feels very much like a combination of Are You Being Served, Coupling and The Vicar of Dibley. I am now on a quest to see the other two plays - Table Manners and Living Together . Sarah, I'm sooooo excited to see this. I've carved out all day May 16 to see the entire show. Maybe you could join us? Nope - I'll be a Wall to Wall Broadway on May 16th!